Are you looking for a bunk bed that gives your teens room so much more? Well, you have come to the right place. 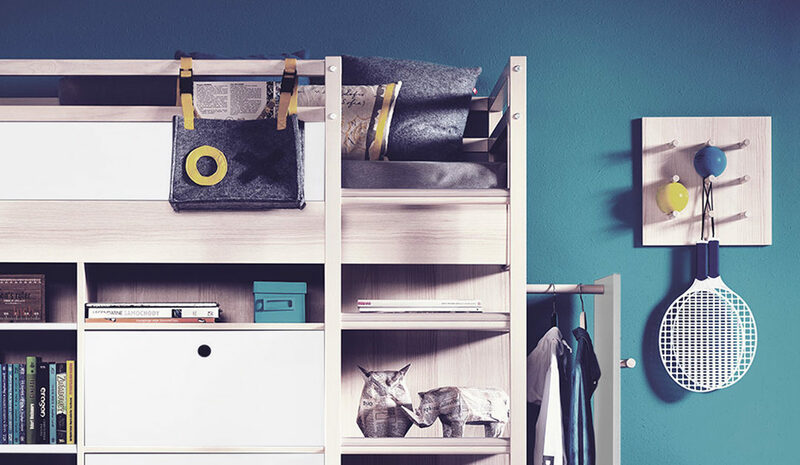 The Spot Bunk Bed from the award-winning Spot Collection from VOX gives your teens space a contemporary look while offering them all that they will need in storage. Let’s have a closer look at why the Spot Bunk Bed is the smart choice. What sets the Spot Bunk Bed apart from other bunk beds on the market is the trendy functionality it brings with its contemporary design. 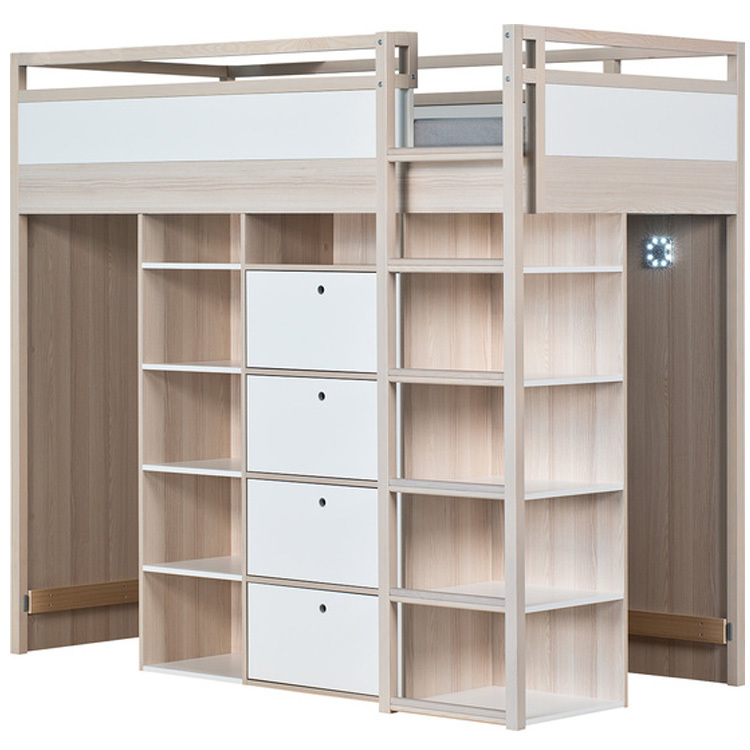 The Spot Bunk Bed offers small teen or kids bedrooms an innovative solution for comfortable sleep coupled with ample shelving and drawer space with an optional roll out smart wardrobe. The frame of the bed acts as storage in your child’s bedroom. With two shelving units on either side of the built-in chest of drawers, your kid can easily express themselves through a display of all their favourite keepsakes. Sticking to the contemporary look and feel of the Spot Collection and on trend for kids bedrooms, the open shelving works well for storage of their clothes or to store your young one’s favourite collections. Therefore, whatever your child’s storage needs may be, the deep shelving space will offer ample. Furthermore, centering the two shelving units are four deep drawers where clothes and other items can be stored, making this is a good place for storage of toys and gadgets for easy reach. If you look at the picture of the Spot Bunk Bed, you will notice two recesses next to the shelving space. These recesses bring an added touch of depth to your kid’s bedroom. Whether you store bikes and gear in there or use it with the signature A-Frame Spot Pull Out Rails, these clever recesses are sure to come in handy. The hanging rail has been designed to fit seamlessly into the recesses. Providing added storage and hanging space for your kid’s bedroom. The hanging rails are easy to remove when playdates come around for some added hide and seek fun. Prepare for lifelong memories to be built for your little one and their friends. With this playful functionality and ease of use come together. Making this a worthwhile addition to the Spot Bunk Bed. An Extra-Length Sleeping Area Fit For A Prince/Princess. Awesome storage space set aside, the Spot Bunk Bed offers an extra-length sleeping area fit for your little prince or princess. With the extra-length mattress that comes with the bunk bed, your little one will drift off to dreamland swiftly. The protection rails that surround the sleeping area will give you and your child a sense of security. Whilst reading about the Spot Bunk Bed is informative, seeing is believing. Watch below and see for yourself why the Spot Bunk is the smart choice. What do you think of the Spot Bunk Bed? Comment below. We’d love to hear from you. Be sure to like us on Facebook and sign up for our newsletter to be the first to know about special offers and new products. Follow us on Instagram @VoxFurnitureSA and get inspired.